Ask about a bumper to bumper extended warranty for this vehicle. 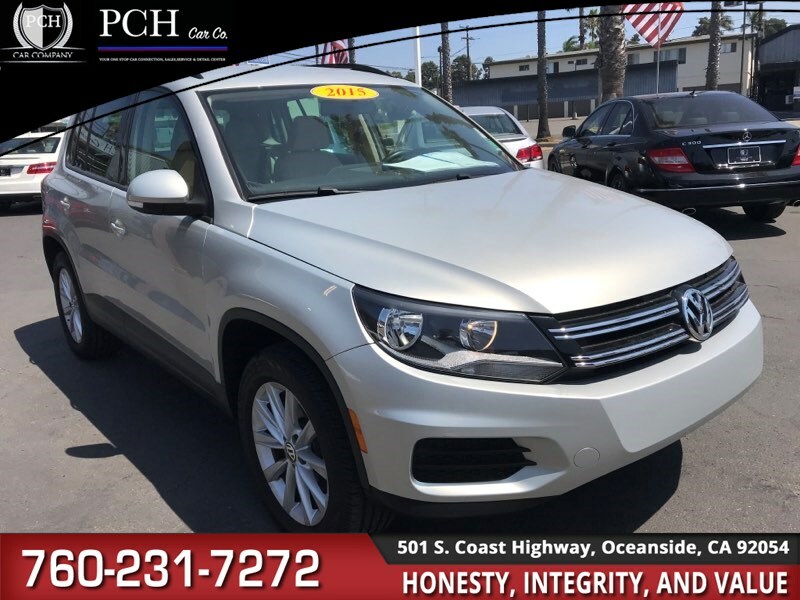 Stoking and sophisticated with a well-executed design, our One Owner 2015 Volkswagen Tiguan SE SUV is German engineering is at its best, presented in stunning Pure White. Powered by a 2.0 Liter 4 Cylinder offering 200hp while tied to a responsive 6 Speed Automatic transmission with Tiptronic and Sport Mode. Behind the wheel of this Front Wheel Drive Tiguan SE, you will delight in impressive acceleration and an exceptionally hushed ride. The graceful lines of our Tiguan SE are accented by great-looking wheels, heated washer nozzles, and heated mirrors. The style continues inside of the Tiguan SE, with comfortable heated seats on premium materials. Enjoy a leather-wrapped steering wheel with audio controls, cruise control, split-folding rear seat, a panoramic sunroof, and a rearview camera. Listening to your favorite music is easy with Bluetooth w/audio streaming, iPod connectivity an 8-speaker AM/FM/CD audio system. Volkswagens passion for your safety shines through with advanced features such as front/side airbags, anti-lock braking, and electronic stability control and have resulted in a Top Safety Pick award by the IIHS. Stand out from the masses by choosing the Tiguan. European driving dynamics and a technology-packed cabin make this practical SUV a no-brainer. Print this page and call us Now... We Know You Will Enjoy Your Test Drive Towards Ownership!